.......53 Buddhas and Me .................My Life Adventures.....: "Zoe"
I just couldn't think of anything to write tonight until I had a look at lovely Darlenes blog post for today. It got me thinking about all the animals I have had during my life and there have been a few. As a child it was my Dad who bought home injured animals such as "Galahs" and "Magpies". 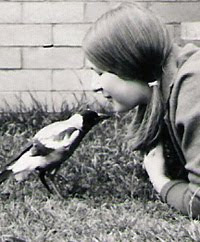 This shot is of my Magpie "Sam" giving me a kiss. 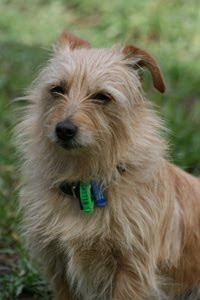 I have also had many Dogs, Cats, Fish, Birds, Chooks, Mice and Guinea Pigs. Zoe our dog at the moment is 1/2 Australian Silkie Terrier and 1/2 Miniature Poodle, she is a very cute dog but a bit noisy in the barking area. 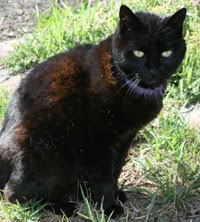 My black cats name is Caspa and is 17 years old - not to sure how much longer we will have her - she is really showing her age. Both Zoe and Caspa spend all day with my dear old Dad. I really think it is good for him to have them around him. Aww, Zoe has my heart captured, he is adorable! Your cat is also a very lovely cat. I am more of a dog person for some reason, maybe because dogs listen and seem to understand? That is also quite the array of pets you have had, what a blessing.